Posted by Janet, doing it better. Today I want to talk about change because if we want to become more productive or if we want others to be more productive, then often that requires some kind of change. I have continuously been told people don’t like change. They resist it. Don’t get me wrong I am sure there is evidence to support this. However there is also evidence to the contrary. Just look around people are making major changes every day; changing jobs, moving, having a family, learning new technology, developing new skills. 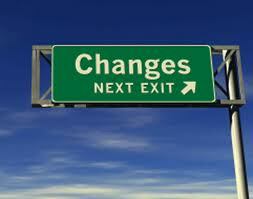 Not all of those changes are easy but most of the time people actively seek out those changes. That doesn’t sound like resistance to me. So what is the problem? Well according to Peter Bregman, in his blog for the Harvard Business Review, the problem is we assume people resist change so we do all kinds of things to counter that resistance. But in reality people don’t resist change they resist being controlled. Now that should be an Aha moment! This would be why 70% of all the major changes corporations try to make fail. If you want to find out more try following this link to an article by the Harvard Business Review on a classic called ‘Leading Change: Why Transformation Efforts Fail’ by John Kotter. So how do you get around people’s resistance? According to Peter give them control. Much easier said than done but Peter also gives a bit of guidance in the form of three steps on how to do this along with an analogy that makes perfect sense to me. Basically you need to be more outcome focused and while you can suggest a route to get that outcome, you also need to be open to different routes as long as the outcome is satisfied. Do you sneak in a nap during the day? Well according to this article in the Gulf Today a short snooze not going beyond 10 minutes increases productivity, improves intelligence and maintains emotional stability. The article goes on to suggest that a mid-day nap is not only accepted in many cultures but some go as far as to set up a special room to allow workers to have a siesta. Mmm I wonder if you would have trouble getting people to buy into that change. Productivity is a measure of how much – work, time, effort, money, or energy – you have to put into something to get the desired outcome. For more tips and tools on how to get more productive please visit Blue Collar Consulting Inc. at http://www.bluecollarconsulting.ca/. About Janet, doing it better. I grew up and still reside in Northern Alberta. While I have numerous interests I am passionate about the Peace River region, its innovation, its people, and the creative spirit that envelopes us all. Posted on April 4, 2012, in change management, employee performance, performance management, productivity, productivity tools and tagged Change management, Performance management, Peter Bregman, Productivity. Bookmark the permalink. 3 Comments. Hi Melissa, Thanks for the comment. I will definitely check out the link on why change fails.